Wildlife Safari’s first baby giraffe, Kelley, has started adventuring further afield, taking his first trips into the main park! 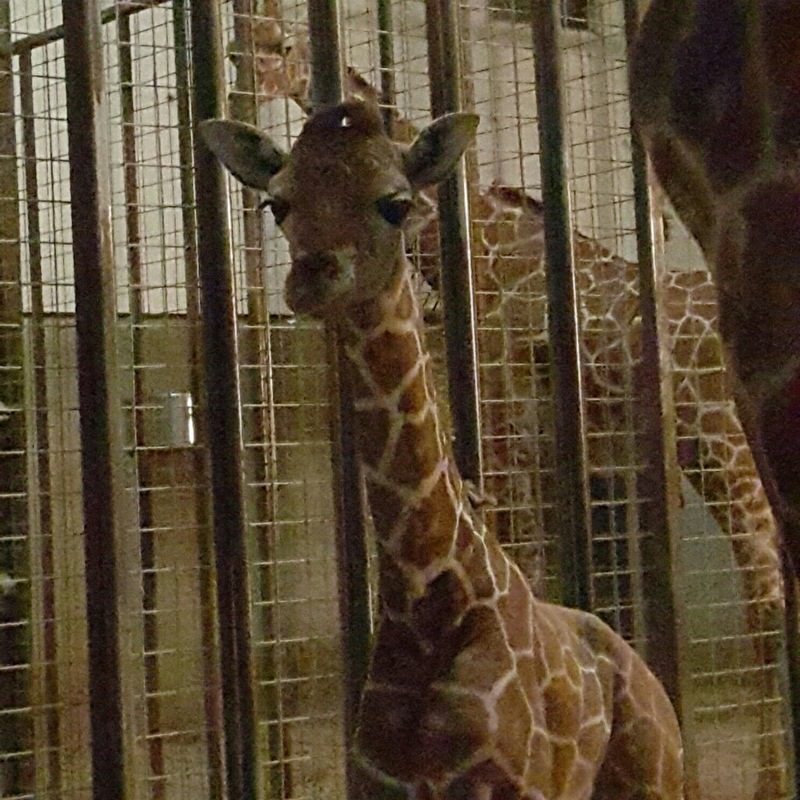 In the months since his birth, Kelley has stayed in the giraffe yard, staying close to the barn and getting used to people and the sight of cars. It’s going to be a slow transition, just short trips out to start with, especially with cold weather meaning little Kelley will need to stick close to the barn (and the heaters!). 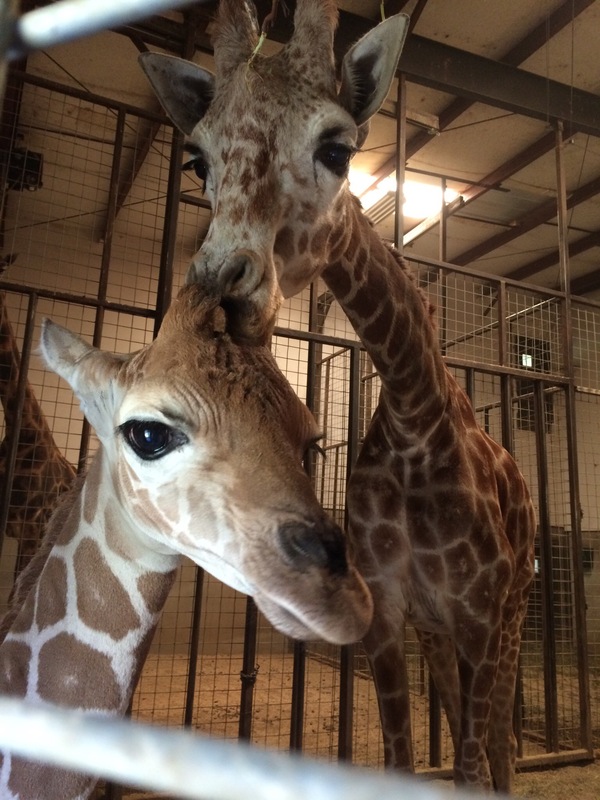 Kelley’s keepers are very excited about this new step for the not-so-little guy. As he gets used to it, Kelley will be able to spend longer periods of time playing in the main drive through – so keep an eye out for him! 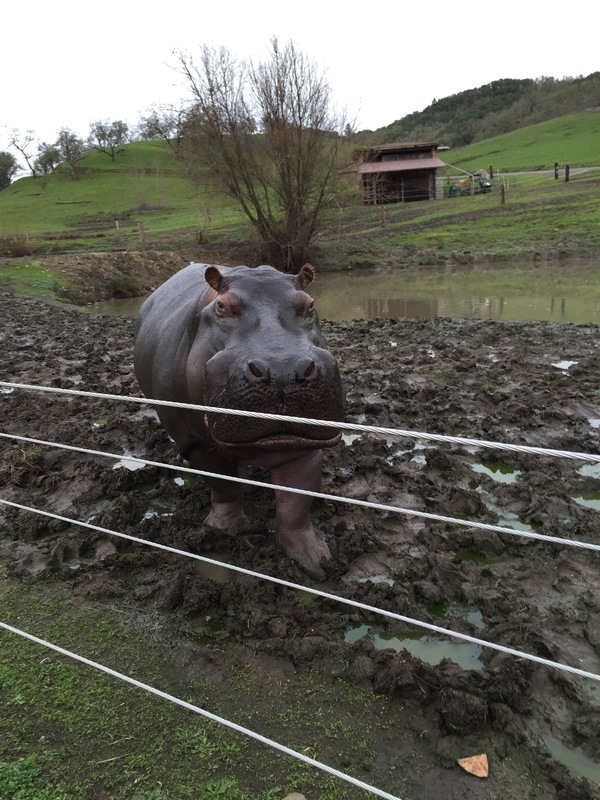 Meet Wildlife Safari’s resident hippos! Blippo and Padron, like many of the animals at the park, have regular training sessions with their keepers. As they are such large animals, these sessions are vitally important for their care – being able to ask them to show their teeth allows keepers to make sure they’re healthy everyday, and catch any issues before they become a real problem. Without using behavioral training for health checks, keepers and veterinarians would need to sedate these large animals to do any kind of check up. This can be stressful for the animal. 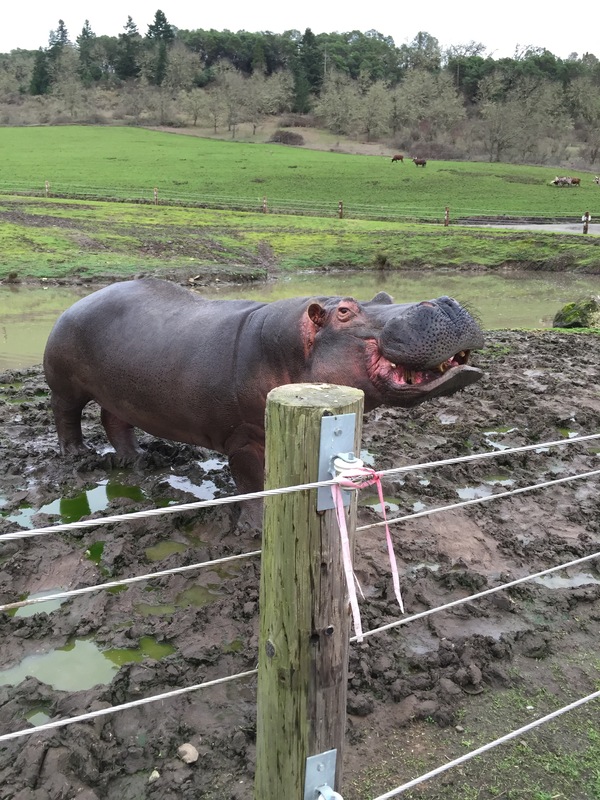 While being able to move the hippos is helpful, it is the open mouthed dental checks that are particularly important. The keepers have captured a behavior to allow for voluntary tooth trims. A drummer has also been slowly introduced to trim their teeth down for a natural wear. Blippo seems to take delight in the vibrations of the drummel, its almost like a tooth massage! Padron is a bit more shy, but is becoming braver every day. 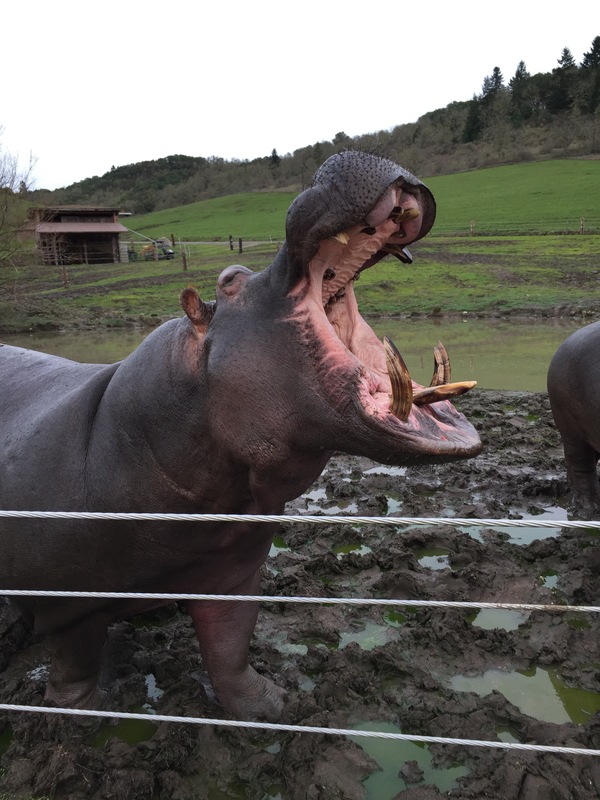 Hippos have large incisors that dig up the grasses and vegetation they eat, with the help of incredibly powerful jaws. 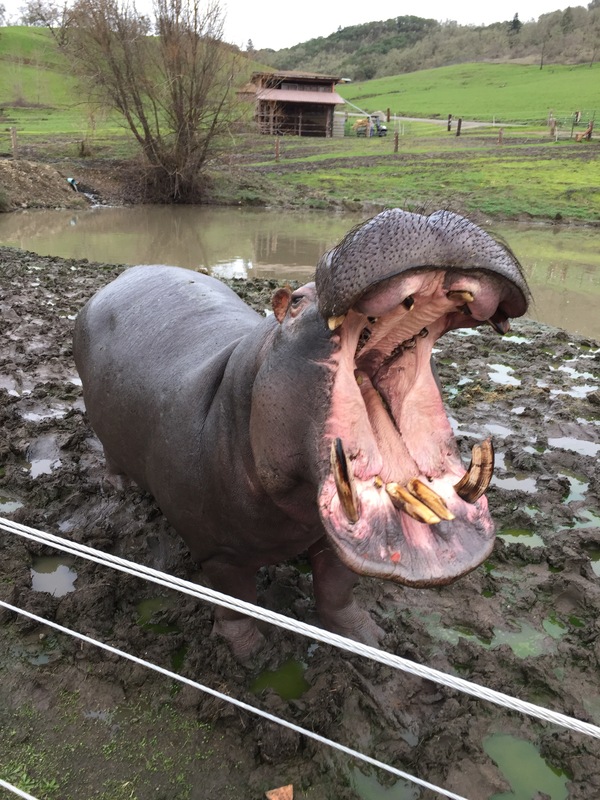 Since hippos are quite tough on their teeth, regular dental checks can catch cracks or damage before they become too serious. 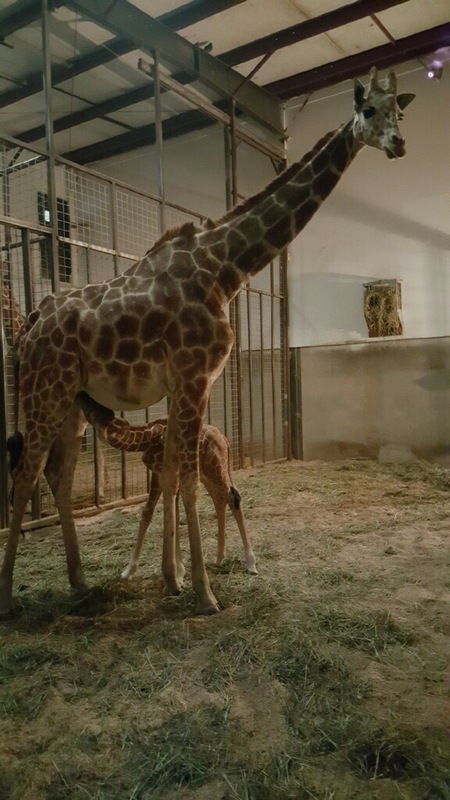 This month is a very special time at Wildlife Safari as we celebrate the birth of our first giraffe calf born here since the park began. 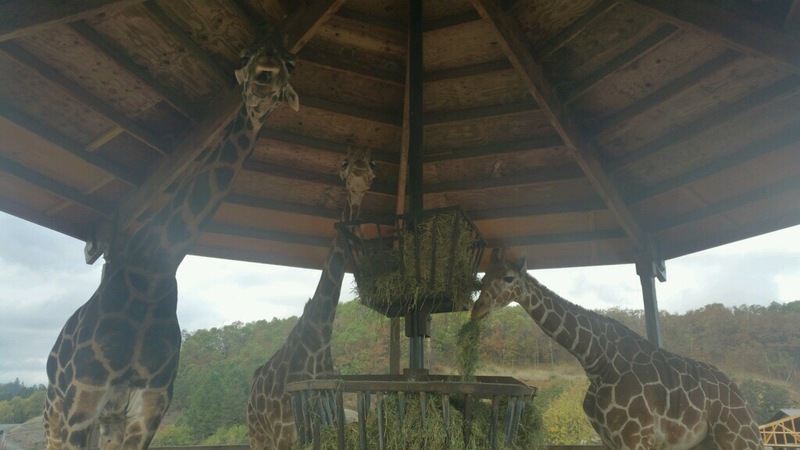 Little Kelley came into the world at over 6 feet tall, though he looks small next to mother, Miya, our 4 year old reticulated giraffe, and even smaller next to father, Mate, our 17 year old Rothschild giraffe who is our tallest at 18 feet. At the moment, Kelley is mostly spending time in the barn with his mother, but he has been meeting lots of new friends as guests of the park can sign up to meet him! 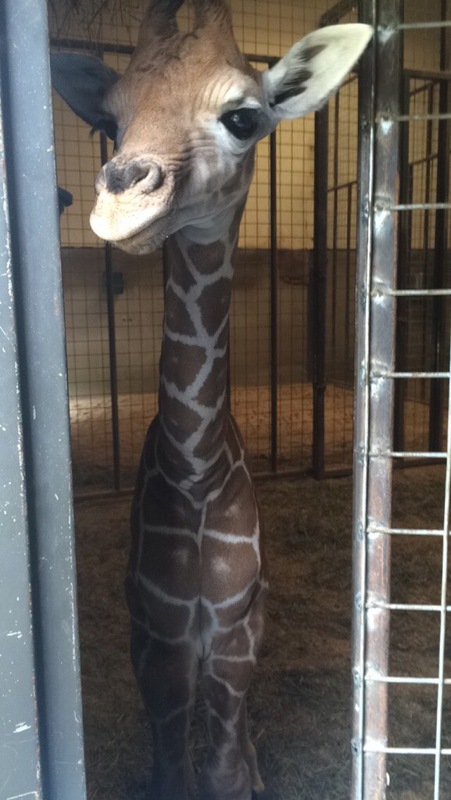 It’s very special to be able to see a young giraffe, so come see his while he’s “small”! Encounter times may change as he grows, so check with Guest Services before signing up. As summer approaches, so does one of the best seasons at the park: baby season! Pretty soon babies will start dropping at Wildlife Safari, and our drive through will be full of small Bison, Rhea, and more! It’s a wonderful season, full of new life, but it does get the keepers on their toes a little more than usual. Here at Safari we count and check on every single one of our animals every day, so when little ones start appearing, making sure they have the correct count gets interesting! We hope to have babies born from Fallow deer, Blackbuck, Wildebeest, Scimitar horned Oryx, and Bison, however, you can never tell how successful a breeding season has been until the count at the end, or how many young will survive to maturity. Of course, our visiting Canadian Geese who migrate in and out of the park with the seasons, are also a part of baby season, with dozens of little goslings running around! Whether you love baby puff-ball birds or prancing fawns, this spring and summer is definitely the time for a Safari!